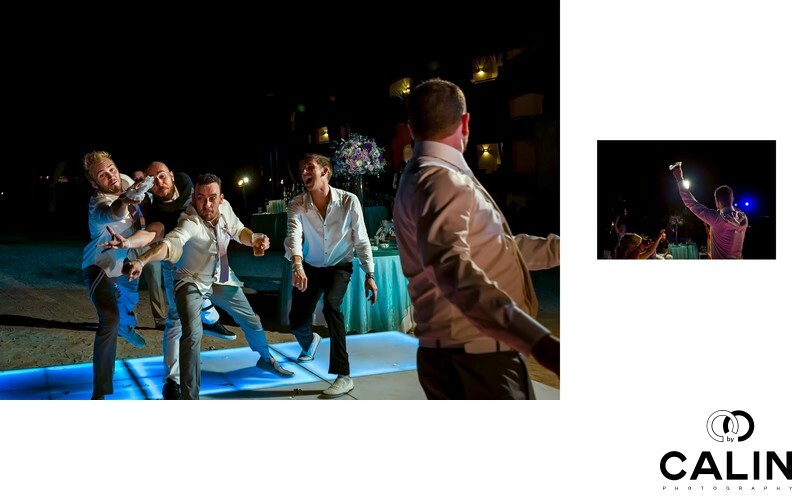 This album spread features the garter toss at a Barcelo Maya Palace Deluxe wedding. After the ladies had their share of fun, it was the boys time to shine. This album spread captures the fun during the garter toss at this beautiful wedding. The image on the left freezes the exact moment when one of the groomsmen caught the garter. He is in midflight with his arm extended reaching for the prize: the garter. On his left, two other guys are doing their best to catch it. On their left one of the contenders is laughing hysterically. In the foreground the groom is caught turning to see the result of his toss. This is a great candid photo. Three out of four men are caught in the air jumping towards the garter. Their facial expressions show intense focus. In stark contrast with them, the groomsmen on their left is laughing. The fact that there are two layers in this image gives the photo dimension. The image in the right showcases the groom raising the garter above his head while the bride is raising a glass cheering for him. Being a Toronto wedding photographer I learned that besides the posed creative shots, the rest of the pictures have to be natural and document the day. This album spread does exactly that: captures great moments and expressions and these photos will be cherished decades down the road.